It’s like throwing a party in your garden when you plant this exciting variety! Heavily ruffled petals are bright, buttery yellow with wide margins of vivid rose red. These stately plants are perfect for anchoring the back border, sending up straight, strong stems that can reach a regal 5’ tall. 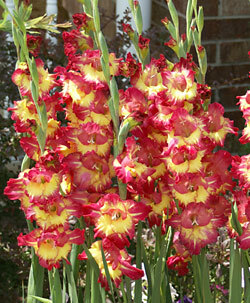 Gladiolus ‘Fun Time’ opens floret after floret in late summer and the performance lasts for weeks, providing a curtain of color that brings any landscape to life. Their long-lasting beauty is equally energizing in arrangements, either mixed with other late summer favorites or as a dramatic bouquet by itself. Order our premium bulbs now for guaranteed garden thrills next summer.